Julian McCullough & Sean O'Connor are two new dads who want to be "Your Two Dads". The two have combined forces with Comedy Central to create a new podcast called "Your Two Dads". They join the Roast Battle crew for a complete dad take over. WARNING: This podcast is not for the easily offended or faint of heart. In addition to being one of the fastest rising comedians in America, Megan Gailey is also a big-time Roast Battle favorite. She’s participated as a battler, as a judge, and this past March at SXSW, as both. After delivering the battle of the weekend in the main event on Day 1, she returned for Day 3 to judge some more of the carnage. On this episode, Megan talks about the experience and we relive four of our favorite fights from Austin. Jena Friedman is one of the most accomplished comics and writers in the business, with credits ranging from Letterman to The Daily Show. She joins us in studio to discuss her recent experience judging Roast Battle at SXSW in Austin, Texas, and we play some exclusive audio from those shows. Mike Lawrence was the original Comedy Central Roast Battle Champion. He’s an absolute legend in our sport, setting the standard as both a battler and a judge. In this episode, The Champ stops by to break down the recent Best Of The Belly Room Volume 2 supercard that he judged last month. Alex is the new Belly Room Roast Battle Champ. But before that, he graced the big screen taking on Robin Tran in season 3 of the Roast battle this past summer. This episode we play Alex's never aired post-TV battle interview, and the 1st time he battled Robin, as well as his highly contested title fight. On this very special episode, Jeff Ross joins us in the studio to discuss the passing of our good friend Brody Stevens. Jeff shares some of his favorite memories about their friendship, and we dig into the archives for three classic battles featuring Brody as a judge. One of Roast Battle's biggest fans Amin Elhassan is on the podcast this week. Former NBA talent scout and famed ESPN sports analysts, Amin has been hanging around the Roast Battle scene for a few years now. To end Black History Month, we touch on topics from the NFL protests to the LGBTQ community's infatuation with the show. Joe Dosch is a Roast Battle legend. He’s a former Belly Room champion, a Season 2 Comedy Central star, and a first-ballot Roast Battle Hall Of Famer. He also hasn’t stepped in the ring in over two years. That’s all about to change. Joe joins the show to talk about free speech, his battle history, and his plans for a return on our upcoming tour. Cleveland's own Ramon Rivas II, creator of the Accidental Comedy Festival and one of Roast Battle's favorite repeat judges, stops by the podcast to talk BATTLE. Rivas is what we call a super judge: very cool, funny, precise, and technical in his analysis. 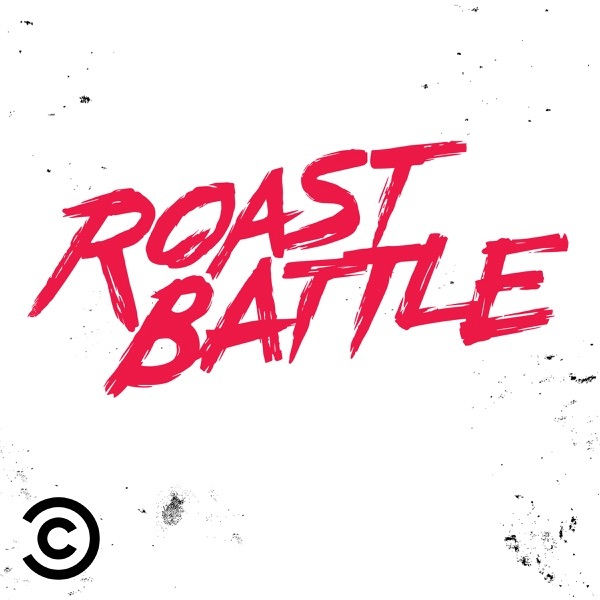 In this episode, Ramon gives extended feedback on what he sees as a judge one night at the Roast Battle. We return with the completion of the very exciting conversation that took place between last week's guest, Leah Kayajanian, and our hosts. All four continue to jockey for position, discussing the very important elements of free speech, and determining where, and if, a line should exist at all. Sprinkled in as usual are some of the coldest roast jokes recorded on the planet, featuring Leah herself. The crew picks up where it left off talking about battling on the road in Tulsa, Oklahoma, with an epic showdown between our co-host Pat and guest Leah. Leah Kayajanian is an undeniable Roast Battle legend. She is a pioneer of the sport, and one of the fiercest active battlers. In the first half of this two-part episode, Leah addresses some concerns she had about Coach Tea's statements from a previous episode, where he and a guest had some controversial comments about a real-life event that Leah experienced. In this special bonus episode, we present the full unedited interview with Anthony Jeselnik (@anthonyjeselnik) and podcast co-host Gregg Rosenthal (@greggrosenthal). The co-hosts of The Jeselnik & Rosenthal Vanity Project stop by the studio to talk about their podcast, Anthony’s rocky history with Comedy Central, and his interesting history judging Roast Battles. Mr. Mean himself Anthony Jeselnik (@anthonyjeselnik) joins the podcast this week. He brought along NFL analyst and childhood friend Gregg Rosenthal (@greggrosenthal). The two have a hit new podcast on the Comedy Central Podcast Network called "The Jeselnik & Rosenthal Vanity Project." Anthony is smug, vain, and one of the funniest people doing comedy. He breaks down why being a judge on the Roast Battle TV show is the best job in comedy, and discusses the next projects he has lined up for fans. We all have a bunch of fun as we cut in and out of 4 fire Roast Battles for all you battle-maniacs to quench your Roast thirst.